Reading, writing, and pronouncing military time is quite different than its standard 12-hour time system counterpart. Military time uses the same number of minutes per hour (60 minutes for every hour), but the way that the hours are expressed is changed. When converting, reading, and writing military time, it is only necessary to change the hours, not the minutes. To read military time, you must express the time using 00 to 23 hours, which represent the number of full hours that have passed since midnight. You can use “2400” to express midnight (12:00 AM in standard time), but it is more common around the globe to use “0000” as midnight is considered the hour at which the new day begins. You will not find any colons or commas in military time, nor will you see any AM or PM suffixes as neither are necessary. This 24-hour military time format is designed to avoid confusion or ambiguity and any possible errors that could result due to a misunderstanding. Outside of the United States, this time keeping system is actually the main method for expressing time such as in the United Kingdom, India, Australia, Germany, and the Philippines. Most clocks, however, are not set up to read military time. As a result, digital clocks are the most common way of keeping military time. However, clever engineers have devised methods for creating more traditional military time analog clocks. In the United States and Canada, the 24-hour clock is referred to as “military time.” It is primarily used by the military, emergency services, aviation, and others who rely on accurate communication of time. While military time does not use colon (“:”) to separate hours and minutes, the 24-hour timekeeping format does. Neither 24-hour time nor military time use AM (ante meridiem) and PM (post meridiem) to distinguish between the morning and afternoon/evening hours as both systems avoid duplicate times (e.g., 12:00 AM and 12:00 PM). Having trouble with the conversion? 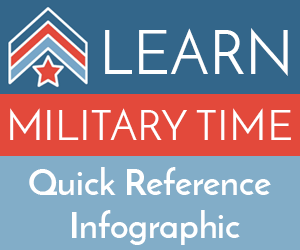 Use our Military Time Converter tool.